Some of today’s most innovative brands are content publishers that are engaging customers with content in addition to finding smart ways to monetize their websites. For example PopSugartaps into big data, machine learning and predictive analytics to make better decisions about how they engage with customers. PopSugar—a site that’s attracted more than 100 million visitors worldwide and 1.5 billion monthly content views—has more than 100 editors creating content driven by site analytics, to discuss the impact that predictive analytics has had on its content strategy, readership numbers and conversion rates. A millennial publication focused on fashion, beauty and fitness—PopSugar turned to Adobe Analytics to make sense of its user data—including search and social behavior—to evolve and refine its content strategy. 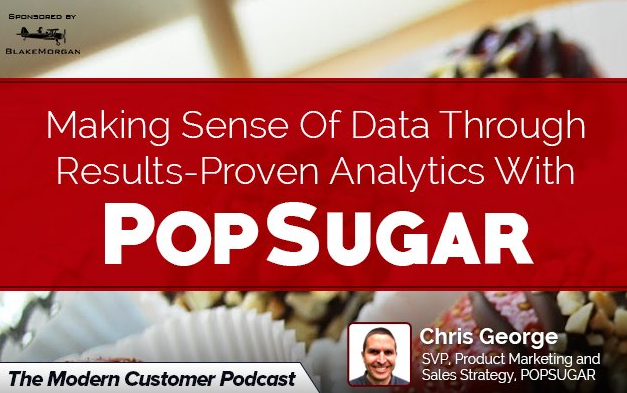 Listen to this podcast with Chris George SVP, Product Marketing and Sales Strategy at PopSugar. In this role, George has launched The Bakery, PopSugar’s full-service creative shop; PopSugar Insights; and SNAP, PopSugar’s native advertising platform. George joined from SpinMedia where he served as EVP, Marketing Solutions managing all aspects of revenue and sales solutions. He’s also held management positions at Fox Interactive Media where he oversaw advertising products, sales development and market intelligence for MySpace and others. He holds a BA degree in advertising from Michigan State University.